Get Herb & Garlic Fries for FREE with the App! 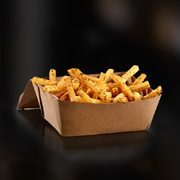 McDonalds McDonald's: Get FREE Herb & Garlic Seasoned Fries with Any Purchase Using the My McD's App Get Herb & Garlic Fries for FREE with the App! Did somebody say free fries? Grab your phone, find a loonie and race to McDonald's, because you can get free Herb & Garlic Seasoned Fries when you make a food or beverage purchase of $1.00 or more! You'll need the My McD's app (Android, iOS) to get this freebie -- simply open the app, tap the offer and display the QR code in-restaurant or apply it to a Mobile Order to redeem your free fries! Don't forget, you can get any size McCafé Premium Roast Coffee for $1.00 until December 16, so you can pair this offer with the McCafé deal to treat yourself to a tasty snack. Easy peasy, lemon squeezy. The in-app offer is available until December 10 at participating restaurants in Ontario -- click here to find the McDonald's restaurant nearest you. Does the 1.00 coffee work for the offer? I don't see why not. The $1 coffee doesn't require a coupon so it should be eligible. The fries cost $3.39 (in my area at least) so this is a great deal! So XL coffee and seasoned fries for everyone today? MB/SK are also excluded. I don't see this deal. Potatoes are generally $2 for a 10lb bag at retail when on sale. So McDonald's is getting them super cheap. Smart move to get people to come in and buy other things. Not seeing it in AB either. Hopefully the potatoes are coming from outside Canada because the United Potato Growers of Canada (UPGC) is expecting a shortage here in the near future. No offer for me in Toronto. In fact I don't have any offers in the app at all, for a couple days now. The app is so lame, you need data or the coupons don't work. Then the stupid worker accuses you of already using the offer. If you go the prepaid route and go pick up they try double charging you and say the order doesnt exist, but hey your name shows up! None of the locations near you have free wifi? ?? There's wifi in all McD's so problem solved. Login to free wifi, open the app, click on the offer and then walk to the kiosk to scan the code. Add the fries to the order and then check out at kiosk and picks up fries. She has only minutes and text on her phone plan. I wonder if this is just additional seasoning added to the salt shaker.